Now it’s the perfect time to go crazy on blackjack with the new BlackJack Classic DELUXE, a terrific game, which will keep you interested and engaged on a daily basis. 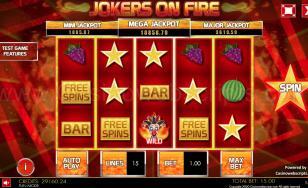 It brings to life the charm and fascination that characterize Las Vegas and allows you to enjoy a fabulous game from the comfort of your own home. 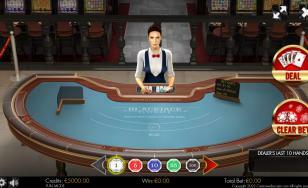 Still, you will feel like you are in a real, luxurious casino, due to the graphic elements presented in the game, entertaining soundtrack and detailed options that will enable you to control your moves flawlessly. Playing and winning has never been easier, especially that now you are presented all the rules from the beginning; thus, even if you are just an amateur you can still increase your gains in no time. In order to play blackjack all you have to do is place your initial bet and then “hit” or “stand” after the dealer has spread the cards. The winner is the player whose total amount of cards is closer to 21. BlackJack Classic DELUXE is probably the most sought-after game of this casino, because it presents high chances of winning big time. Wait no more, place your bet, and prepare yourself for a real challenge. This is a double deck BlackJack Card game. Each deck contains 52 cards. If player and the House tie, it is a push and no one wins and no one loses. Ace and 10 (Natural Blackjack) on the first two cards dealt is an automatic player win at 3:2, unless the house ties. A player may stand at any time. To win, the player must beat the dealer without busting. A bust happens when the cards of the player total to more than 21 and this will cause the player to lose automatically. If the player will bust, the dealer will only reveal his face-down card and the game will end. The winner is whoever has closest to a total of 21. All the decks of cards are used and are shuffled together by the dealer and placed in a card dispensing box called Shoe. Before receiving any cards, the player must place a wager. Then the player is dealt two cards face up. The dealer gets one face up, one face down. The player can stay or take more cards to try and get closer to 21 without busting. If the player did not bust, then the player can wait for the dealer's turn. When the player is done, the dealer turns up the down card. 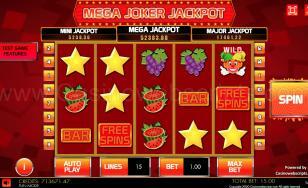 By rule, on counts of SOFT 17 or higher the dealer must stay; on counts of 16 or lower the dealer must draw. If the player makes a total of 21 with the first two cards (a 10 or a face and an Ace), the player wins automatically. This is called Natural Blackjack. 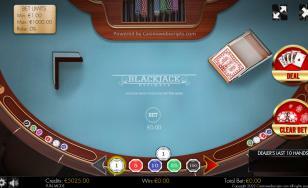 If the player has Natural Blackjack, his bet pays 3:2, unless the dealer also has Natural Blackjack, in which case it is a Push or a Tie (or a Stand-off) and the player receives back his bet and the game will end. If the dealer has Natural Blackjack and the player does not have Natural Blackjack, then the player will lose the bet and the player cannot perform any action: hit/stand/double/split, and the game will end. If the player does not have Natural Blackjack and he has a higher count than the dealer (including when he does 21 with more than 2 cards), he wins an amount equal to his bet (1:1). If the player does not have Natural Blackjack and has a lower count than the dealer he lose his bet. 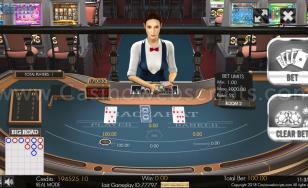 If the dealer busts, the player wins an amount equal to his bet (1:1). 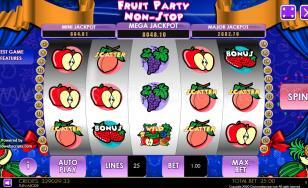 There are other betting options namely Insurance, Double Down and Split. Insurance : side bet equal to half of the initial bet against the dealer having a natural 21 - allowed only when the dealer s showing card is an Ace. If the dealer has a 10 value face down card and makes a Natural blackjack, insurance pays at 2:1 odds, but loses if the dealer does not. Double Down : double your initial bet following the initial two-card deal, but you can hit one card only. A good bet if the player is in a strong situation. 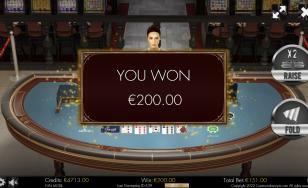 Most casinos will allow you to double down on any two cards. Some casinos will let you double down after splitting and some will limit your doubling down to hands that total ten or eleven. However, there is one condition: When you double down, you must take one additional card and you cannot receive more than one. Split Hand : split the initial two-card hand into two and play them separately - allowed only when the two first cards are of equal number (EG: 2 of Spades 2 of Hearts or King of Hearts King of Diamonds). 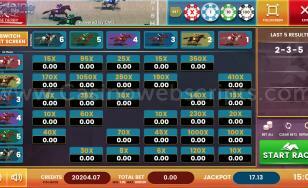 Use each card as the start to a separate hand and place a second bet equal to the first. 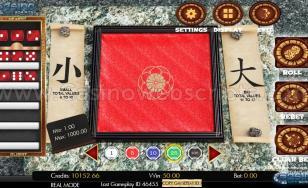 ACE (10 value card) after Split, is not considered Natural Blackjack. The probability of the player to win in this game is 42.22%. 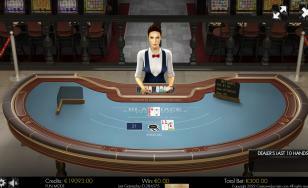 1.Gameplays that were disrupted due to client or internet connection issues, can be restored upon restarting the game, unless the last player action was received by the server and it was an action that would result in a player win/loss (FOLD,BUST,STAND).